Hong Kong has taken the first steps in criminalizing disrespect of China's national anthem in what critics say is a bid to stem political criticism in the semi-autonomous Chinese city. A bill is currently before the legislative council, Hong Kong's quasi-democratic legislature, that will hand down three years of jail time and a fine of around $6,300 for "publicly and intentionally [insulting] the anthem in any way" or using it for commercial purposes. It also states that primary and secondary school students must learn to sing the anthem as well as its "history and spirit." The bill passed its second reading in late January and is expected to become law later this year, following in the footsteps of a similar law Beijing enacted in 2017. Hong Kong's Constitutional and Mainland Affairs Office said by email that the purpose of the new law "aims to preserve the dignity of the national anthem and to regulate the playing and singing of it." "March of the Volunteers," the national anthem shared by Hong Kong, China and Macau, became the focus of much public hostility in 2015 following the failure of the city's Umbrella Movement democracy protests the previous year. 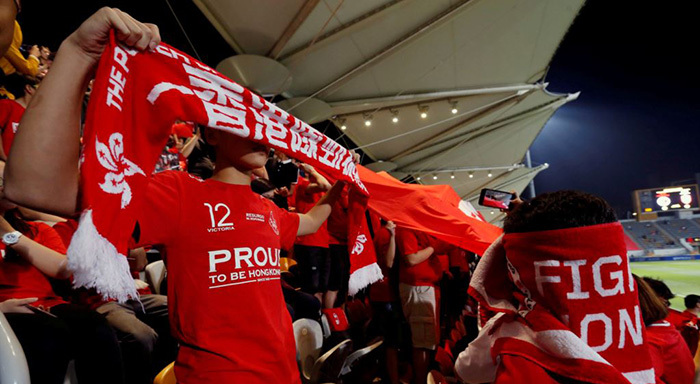 Local soccer fans regularly booed the anthem during important matches, many of which were aired on national television in China. The booing has continued sporadically since then and is seen as a reflection of many residents' mixed feelings for Beijing and the local government. The U.S., Canada, Australia and the U.K., conversely, do not have any penalties, according to Freedom House, a U.S.-based organization that monitors freedom of speech around the world. In many cases, however, laws relating to the national anthem or flag are not "aggressively enforced," according to Robert Ruby, director of communications at Freedom House. In Hong Kong, however, critics have expressed concern at how its future national anthem law will be carried out. Philip Dykes, chairman of the Council of the Hong Kong Bar Association, said the law differed from protocols in other countries in that it was "coercive" and required individuals to behave in a certain way, while sanctioning those who failed to "conform." He also expressed concern at how it would be enforced.